Desiderata, an inspirational prose poem, has been loved by people for generations. It offers common-sense advice for enjoying life. It is a credo for living that found a foothold in California in the 1960s, where it affirmed San Francisco’s counterculture with its philosophy of love and peace. Reprinted by underground presses, it hung on walls all over the country. Today it is making a comeback as yesterday’s youth are today’s parents and grandparents, and this time-honored wisdom is being passed down. It was 1988 when I first read Desiderata. I immediately loved it and wrote all 300 words down on a piece of scrap paper. As a calligrapher, I was already selling my inspirational art prints and I knew these words would hold deep meaning for others as well. The version I saw said it was written in 1692, so I figured there would be no issue with copyright. Then I came across a copy that said it was written in 1927 and needed permission to reprint it. I wrote to Robert L. Bell for the rights to use it. He was asking for a lot of money in royalties and I didn't think I could sell enough to cover the initial amount. 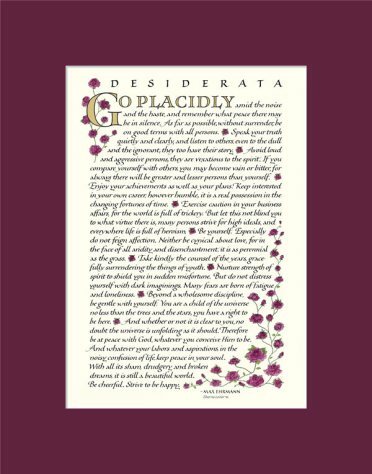 But then I got a lucky break and landed a spot in the Red Rose Collection catalog with my poster version of Desiderata. I knew then that I could cover the royalties and went ahead with the contract. Robert Bell and I kept up a lively correspondence over the years until he passed away in 2009. In 1996 a friend of mine was starting to design websites and used the idea of selling my prints online to test her learning skills. With that, Ink Monkey Press was born and I started selling my prints online at inkmonkey.com. But Desiderata was my specialty and I wanted to get it better known. 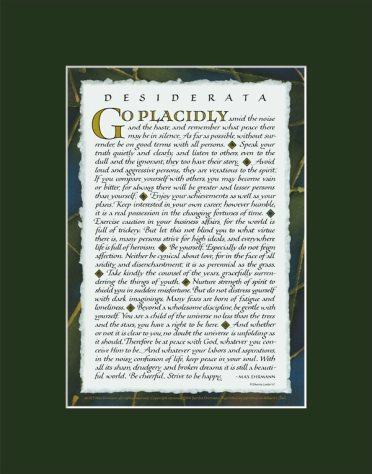 After much research and some good luck, I was able to buy desiderata.com from a young gentleman who owned the url and was looking to sell it to get some money to help with his college education. I have made this a resourceful site. There is a lot of misinformation floating around the web about where Desiderata came from so I have gathered articles and other facts to guide one along. There are a lot of versions of Desiderata, but I have used the first known printed version from the book that his wife, Bertha Ehrmann, had published of his work in 1948. A copy of that page is here. I have also aimed at sharing other people’s heartfelt connections to Desiderata in the reviews that they write after purchasing one of my prints. In this vast world wide web of automation and conglomerates, I want you to know that there is a real person here at this end. The original lettering of these prints was done by hand and I also drew and painted the flowers and diamonds. I oversee all the printing, place prints in the mats, wash the glass for the framed pieces, and even answer the phone. So when you want a human connection for these words with a human heart, here is where you will find it. Thank you for visiting, stay for a while, enjoy…It is still a beautiful world. Be cheerful. Strive to be happy. 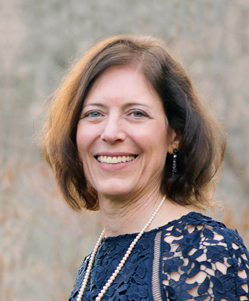 Artist and calligrapher Sherrie Lovler has designed two beautiful versions of Desiderata prints and posters, one with roses and one with diamonds. Many colors and sizes to choose from. Read your own copy every day!